While male courtiers and eunuchs typically wore the chlamys for ceremony, many other garments are mentioned in the Byzantine sources that prescribe what garments courtiers should wear for specific events, or what garments are awarded to them as part of their salaries. The Book of Ceremonies, the Kletorologion, and several histories record the names of many such garments, the majority of which are either tunics or cloaks. With several exceptions these terms can usually be defined, but the terms cannot give us more than a vague image of each garment. Many terms, such as skaramangion, have even been misidentified by scholars and subsequently used incorrectly in modern literature. 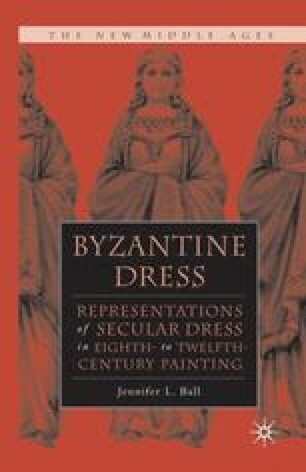 The problem of terminology is aggravated by the fact that few portraits of Middle Byzantine courtiers exist, leaving us with no visual record of these garments. The case of women at court, who were typically the wives of courtiers and female relatives of the imperial couple, is even worse as they are hardly mentioned in the sources and only one manuscript with portraits of court women survives1 (Vatican City, Biblioteca Apostolica Vaticana, MS Gr. 1851, fols. 6 and 3v) (plate 12).